I have everything I need to begin. 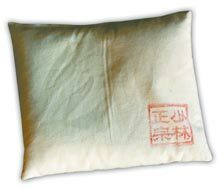 An iron palm bag filled with mung beans, jow, and a good 20 minutes of time. I’m going to start slow because in the past I have rushed into fitness things too quickly and ended up overdoing it and having to slow my progress. I also know that with body conditioning it’s usually best to progress slower rather than faster, so I’m going to go slower than some people might. – palm – obviously. This is iron palm. – back of palm – a sensitive and fragile part of the hand. I never strike with it but I’m going to start training it anyway for the sake of tradition and if I don’t feel like I’m making any progress I’ll drop it from the training. I’m not going to train the finger tips. I don’t believe it provides any benefit, and I’m not going to stab my fingers into anyone, anyway. I’ve seen some people talk about putting your fingers through Coke cans and that kind of thing. No thanks. The bag I am using is from Wing Lam. I chose that one based on my experience with the company in the past. My iron palm bag is on a stack of concrete blocks. My training diary starts here, or you can choose a post from the menu at the right.